Further to the library of PDF based customer case studies, I am pleased to announce our first video case study with joint Citrix and AppSense customer, The University of Texas Medical Branch (UTMB). Hurricane Ike caused a major power outage at UTMB and left employees without access to their desktops, IT knew they needed a new method to remotely deliver desktops to any user, in any location – so, UTMB turned to Citrix XenDesktop. They were already familiar with Citrix technologies on account of their existing XenApp farm, and have been extremely happy with the results of XenDesktop, however, XenDesktop “simply lacked the level of personalization we were looking for” says Landon Winburn, Software Systems Specialist at UTMB. UTMB ‘turned to AppSense to help solve their end-user personalization issues and to increase end-user satisfaction’ as part of their Citrix XenDesktop deployment. Landon goes on to explain that “after researching a number of user virtualization solutions, we chose AppSense because it worked in heterogeneous environments, provided effective management of multiple delivery mechanisms, and provided a consistent desktop to our employees which looked identical to their physical PC”. I believe Landon will be at this weeks Citrix Synergy event, so if you see him, feel free to say hi and ask about their joint Citrix XenDesktop and AppSense environment. As you may be aware, Citrix recommend AppSense as the leading User Environment Manager solution and together we promote a joint XenDesktop + AppSense solution for large enterprise environments. Further to the joint Citrix XenDesktop & AppSense collateral that can be found on the Citrix webpages, leading industry analyst and commentator Doug Brown from DABCC brought Derek Cheung (Senior Product Marketing Manager for XenDesktop, Citrix) and myself (Product Marketing Manager, AppSense) together to record a Video Podcast. The podcast covers an overview of Citrix XenDesktop 4 and when, why and how AppSense is essential in certain environments and has enabled some of the largest Citrix deployments where we together share some 4,000+ customers. For further information and to see this video podcast in full, please visit DABCC via this link. Douglas Brown interviews Martin Ingram, Vice President of Strategy at AppSense. Douglas and Martin discuss the recent release of Citrix XenDesktop 4, what this means for the desktop virtualization, AppSense, and VMware. Martin also talks a bit about their upcoming “user installed applications” technology which will allow end-users to install their own applications and have those apps roam with the user while allowing IT to centrally manage these ‘one off’ applications centrally. I’ve always been a massive advocate of ‘KISS’ – Not the grease-paint laden 1970s glam rock band (although I do own a few dozen of their albums and sport their band logo on my arm!) – the concept of ‘Keep It Simple, Stupid’. In my opinion, one of the most important factors in designing and building software is to ensure that the user interface, and the concepts behind the software itself, are kept as simple and intuitive as possible. There’s no point in implementing a killer feature if that feature is too complex and too difficult to actually configure and maintain as it may result in confused end-users and, inevitably, a redundant piece of functionality. On the other hand, by reducing the complexity of a particular piece of functionality too much, software vendors run the risk of making that particular feature totally inflexible and to some extent of little to no use to the end-user at all! Therefore, there has to be a balance between simplicity and flexibility. A good product needs to be designed well, proven to work and simple to understand. Take the rock group KISS as an example. They started way back in the early 70’s with a lead guitarist, a bass player, lead vocalist and a drummer. Add some make-up and a track list of great songs and a global brand was instantly created. The concept was simple. Start tampering with a working formula and things start to go wrong. Change the appearance (i.e. remove the make-up) and the ‘product’ becomes misunderstood. Start making things more complex and consumers become disillusioned. AppSense Environment Manager can be seen as a complex product. It can be used in a variety of ways to solve a variety of different environment problems. So, have AppSense delivered on the concept of ‘KISS’ with Environment Manager? Have we provided a killer product that is simple to understand, yet flexible and compelling? Maybe, maybe not. There is always room for improvement. However, improvement must not come at a cost to the consumer. Our next product release, currently scheduled for Q1 2010, aims to introduce improvements to the way the software is currently configured and maintained, without adding unecessary complexity or introducing the risk of ‘breaking something that used to work’. So, ‘Keeping It Simple, Stupid’ is, ironically, not a simple task. However, by adopting the concept, it may save you many ‘Crazy, Crazy Nights’ trying to put things right in the future. 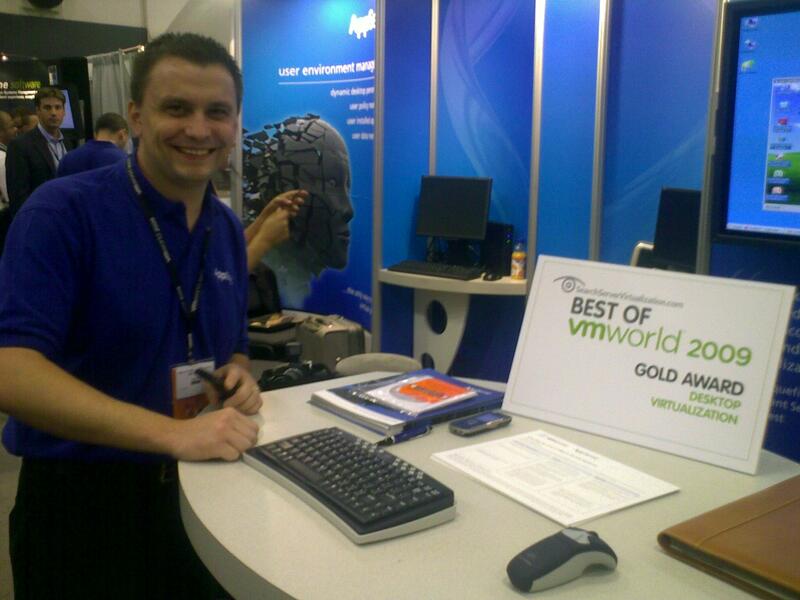 Live from VMworld 09, AppSense – the world leading User Environment Management solution provider – are extremely pleased to be awarded Gold in the Best Desktop Virtualization award for AppSense Environment Manager 8.0. AppSense beat off strong competition from Liquidware Labs for their Desktop Virtualization Diagnostics tool, Stratusphere, and Workspace Virtualization vendor Virtual Computer Inc. for their NxTop product. Like most that witness the capabilities of AppSense, the VMworld judges said “AppSense rocked our boat… It offers the most complete user environment management system out there.” This comes as a further endorsement (following the recent announcement from Citrix) on the importance of a true UEM solution to enable enterprise adoption of VDI at lowest possible cost over and above basic in-built profile management technologies. AppSense Environment Manager enables IT to deliver fully personalized virtual desktops from just a single set of OS and Application images, enabling scalable user adoption. UEM allows organizations to implement virtual desktops at much lower TCO than using Profile Management alone. “UEM addresses not just personal settings and profile data, but also the initial configuration of a desktop, including applying user installed applications, providing a ‘follow-me’ personality with cross operating system platform support, as well as enterprise-scalability and end-to-end visibility. Personalization settings can be managed across multiple operating systems, desktop delivery mechanisms and on virtual, physical and offline devices.” explains Pete Rawlinson, VP of Marketing for AppSense. Live from VMworld 2009 – A press release shows that VMware are to OEM the RTO Virtual Profiles Product into VMware View. On the recent announcement at VMworld 2009, VMware are planning to OEM the RTO Virtual Profiles™ technology into VMware View – this is great news, and yet another proof point of the importance of user personalization in the virtual desktop space. It looks as though VMware have made a similar move Citrix did some months back when they acquired SepagoPROFILES for inclusion into their Xen line, and it makes total sense. Let’s take a minute to appreciate the basic premise of how to reduce desktop TCO through virtualization. The only way to deliver cost-effective virtual desktops is to standardize the corporate image. However, if you standardize, then you also have to provide personalization capabilities in order to get the user adoption needed to make the transition to virtual desktops a success. In this respect, providing some level of personalization baked into platform solutions such as View is necessary. By adding RTO technology, VMware will leverage the Windows User Roaming Profile – which has been successfully used in Terminal Services environments for many years. This will certainly ease some of the pains typically associated with Roaming Profiles, such as profile corruption and slow logon times. However, in more complex, enterprise environments, something more than profile management is required to provide a local PC equivalent experience from a virtualized, standard corporate desktop (as Sumit Dhawan has explained here). Personalizing a virtual desktop requires the ability to automatically set-up and configure the desktop based on the user’s role and context (e.g. what printers they can use, what drives they can access, use of peripheral devices), support for the installation and persistence of user-installed applications, as well as the application of all user-customized settings across all applications. All these in combination are known as the ‘user environment’, and the most important characteristic of the user environment is that it is client OS and delivery mechanism agnostic – effectively providing a ‘follow me’ user personality anywhere, using any delivery method and to any device. This is simply not possible using profile management alone, and why a User Environment Management Solution is required. The thing is, most companies don’t have homogeneous desktop estates. This is true in physical PCs today and will also be the case in their virtualized equivalents. Companies typically use combinations of delivery technologies, applications (corporate and non-corporate), client OS and devices to deliver an optimum, productive working experience to their employees. Based on extensive experience with many customers rolling out desktop virtualization projects, we know that successful (i.e. low-cost, high adoption) virtual desktops require the ability to automatically deliver non-persisted, leveraged corporate OS and apps on-demand from a centralized source. To this fresh, clean desktop session must then be added the independently-managed user environment as described above – note this must be added selectively in response to user actions. We are well beyond profile management now! Adding RTO Virtual Profiles into the View offering will certainly enable VMware’s customer base to start to roll-out Windows XP based virtual desktops (Windows Vista & Windows 7 will be supported in future releases) in a controlled way, while providing some personalization capabilities. As these implementations start to grow, the need for a more comprehensive treatment of the user environment will become essential. User personalization is an exciting and rapidly-growing space! We’re working closely with VMware, Citrix, Microsoft and our joint customers to ensure successful and viable virtual desktop roll-outs …..we look forward to seeing this vital part of the new desktop paradigm grow in importance over the coming months and years! You are currently browsing the archives for the Sepago category.